Can You Treat Tonsil Stones with a Waterpik Water Flosser? Can You Remove Tonsil Stones at Home? How Does Waterpik Help with Tonsil Stones? Tonsil stones are not pleasant… but do you really need to go to the dentist or can you deal with them at home? Before we delve into the world of tonsil stone home-removal methods (including how to use your Waterpik to ease out the stones) we should cover in more depth what they actually are and how you can prevent them in the future! Tonsil stones, also known as Tonsilloliths (which sounds like an epic dinosaur name), are simply a buildup of bacteria, food, particles and other debris in the tonsil cavities in your mouth. Just like plaque can build up between your teeth without proper cleaning, tonsil stones will build up in a similar way. They can be very uncomfortable and even be distracting once you know they’re there. But, they are very rarely dangerous. The debris that builds up is benign – at worst you may develop an infection if you don’t take oral hygiene seriously – even though it gets as rock hard as a stone. The stones will be white-yellow in color and aren’t always immediately visible. They grow in the tonsils (at the back of the throat) as there are many little crevices and gaps where debris can build up. They may be small lumps, no larger than a grain of rice, but if the debris is allowed to build up further they may reach the size of your thumbnail. Tonsil stones are actually becoming far more common now that fewer people have their tonsils removed, so if you notice hard lumps forming on your tonsils don’t panic. You’re not alone and treatment is super simple! If you’ve got large tonsil stones, they’ll usually be very visible. You can use the back camera on your phone with a flash to take a picture of your tonsils if you can’t see any from the angle in the mirror. As you can tell, these symptoms are pretty vague and having just one or two could be a sign of a completely different condition. So, if you notice any of these symptoms make sure to take a closer look at your tonsils and keep an eye out for any whiteish debris that will confirm your home-diagnosis of tonsil stones. Tonsil stones aren’t contagious, so don’t worry about sharing a kiss while you’re waiting for your stones to go away. Although, as one of the main causes of tonsil stones is poor dental hygiene, you may struggle to find someone to kiss anyway! Simply maintaining good dental hygiene will eliminate the biggest cause. You are also more prone to developing tonsil stones if you have recurring tonsillitis or abnormally large tonsils. Generally, your best course of action, if this is the cause of your tonsil stones, is to have your tonsils removed. No amount of good oral hygiene will stop you getting tonsil stones if the buildup is solely due to their large size. If you want to seek treatment to remove symptoms, reduce your stones or remove them entirely, there are lots of things you can try at home. Ideally, you want to dislodge them naturally in as gentle a way as possible. Gargling and coughing regularly can help to loosen them. You can also try dislodging them with a Waterpik (details below) or cotton bud – if they aren’t easily poked loose, just leave them be and keep gargling and coughing before trying again. Forcefully removing them before they’ve started to dislodge naturally can rip your tonsils, leading to an infection. Plus, this will be quite painful! If you want a permanent solution to get rid of your tonsil stones once and for all, you’ll need to have your tonsils removed. Focus on keeping your tonsils clean and fresh. Brushing your teeth isn’t enough to prevent tonsil stones alone, so you need to floss regularly to prevent food build up and gargle with mouthwash. If you ensure that there are no food debris, bacteria, fungi or plaque left floating around in your mouth, your tonsils will stay stone-free. 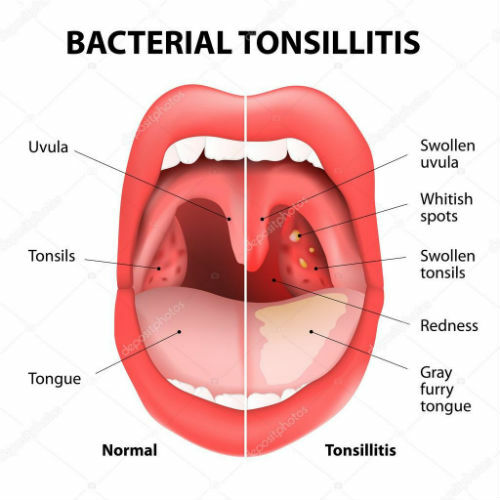 If your tonsil stones are caused by tonsillitis and other throat infections that frequently leave your tonsils susceptible to bacteria, you can try a course of antibiotics for immediate relief. This will inhibit the bacteria and give your tonsils enough time to recover and strengthen. The permanent prevention solution? Have your tonsils taken out? You won’t miss them! Alone, tonsil stones are not harmful. They’re just organic debris that’s gathered and solidified in your tonsils. Tonsil stones are also linked to halitosis and in general indicate poor oral hygiene. So, while the tonsil stones themselves may be relatively harmless, having poor dental hygiene can cause you serious problems in the future. These are all common problems you’ll have if you don’t maintain your oral hygiene. But it gets worse… gum disease and plaque buildups are actually linked to heart diseases. When the plaque dislodges and enters your blood through your damaged gums, it can build up in the arteries around your heart. Brushing, flossing and using mouthwash is simple yet so effective at preventing a plethora of different medical conditions which left untreated could cause serious damage. The actual stones are very rare. Everyone is going to get some buildup of debris in their tonsils, just due to their location in your throat. For the vast majority of people, this buildup doesn’t have the chance to solidify and grow. Actual stones in your tonsils, comprised of very hard debris that’s built up to the size of a grape, is extremely rare. Tonsil stones don’t get that large without you noticing! Brush your teeth and swirl around some mouthwash twice a day and your chances of developing huge tonsil stones are virtually “rock” bottom. Small stones are more common, but very rarely will they just appear out of nowhere. Usually these small stones, or pebbles as they should be called, build up after you’ve had tonsillitis. They will dislodge and break up by themselves as your throat heals. If they don’t, coughing/gargling and gentle poking can dislodge them… if chronic tonsillitis is a problem for you, you really should consider having them removed. Yes, you can. It’s important to know that you can also go to a dentist to arrange to have them removed – you’re not limited to these home methods. Gargling and Coughing – use salt water to regularly gargle and cough vigorously into a tissue. Removal – use a cotton bud or other soft, gentle object to ease them out if you feel they are loose. Antibiotics – go to your doctor for a prescription. This will stop bacteria from forming new stones while you have a chance to dislodge any existing stones and build up good hygiene. The key is to be gentle and patient. The last thing you want to do is damage your tonsils. A Waterpik shoots water and is perfect for flossing your teeth… but can it be used to dislodge your tonsil stones? Yes. People are actually doing this. Waterpiks are not designed for this, but if you’re desperate and need relief, it is an option. Be sensible and use a good Waterpik! For removing tonsil stones Waterpik WP 660 is our number one choice water flosser. It has Hydro-Pulse massage mode which is specially designed to be gentle on your gums. You want to use this mode for massaging out your tonsil stones. It also has 10 different pressure control settings, so you can gently increase the flow until the stones just slide out, plus 7 tips to choose from. Once your stones are gone, continue to use the Waterpik to really clean between your teeth. The less plaque buildup in your mouth, the lower the chances of developing new tonsil stones.